That was Jordan Henderson speaking in November 2011, five months after he was transferred from Sunderland to Liverpool for a hefty £20 million. Call it the seven (and a half) year itch but something just changed big time over the last 10 days. 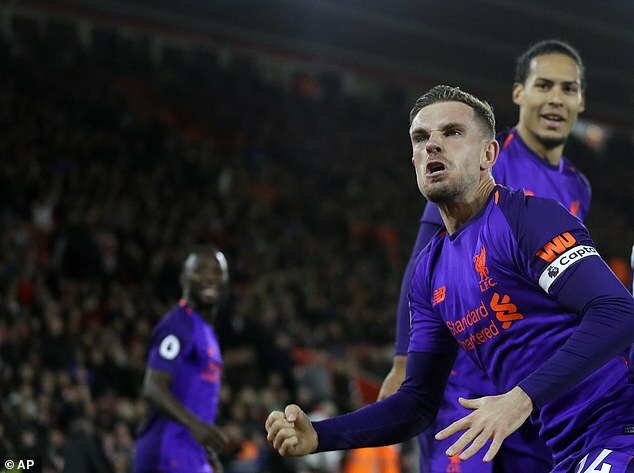 When the Liverpool skipper came on against Southampton a week and a half ago, he supercharged a title challenge that was stalling on the South Coast. This was Jordan the Destroyer cruising through the Solent, the box-to-box attack dog that Reds fans last caught glimpse of in the title charge five years ago. As boss and on-field leader embraced at St Mary’s Stadium under this new enlightened role, Jurgen Klopp let us in to a secret: “We spoke about that because he played for England and looked really good. He has played incredible games as a number six for us. All midfielders have to offer me things, and I have to make my mind up. What he did today was fantastic. First goal for a while, so that’s a nice sign.” Indeed, Henderson celebrated his goal like a man possessed, a man who had shaken off a few demons too. The last time Liverpool yearned for their number 14 this much was on a sunny bittersweet Anfield day, the 25th Hillsborough anniversary. Emotional celebrations followed a nerve-shredding 3-2 victory over Manchester City that saw them come within touching distance of a first Premier League title. “I knew I couldn’t replace him,” sighed Brendan Rodgers, acknowledging it was that missing cog that really put a spanner in the works of the Ball Street Crash against Chelsea and the three-goal capitulation of Crystanbul. Stevie G’s slip was the slam into the wall, but the mechanics had been tampered with a few games before. Yesterday, against Chelsea, Henderson didn’t stay on the full pitch for the full match either but this time he got a rousing ovation rather than a sympathetic one. His brilliant stand-up cross for Sadio Mane’s goal was the culmination of another all-action hero performance in a more advanced role. Under Rodgers, the Wearsider played his first season wide on the right, played as a wing-back, and wide in a midfield four, before settling in a more progressive role to Gerrard’s deep-lying quarterback in 2013/14. Under Klopp, Henderson made the transition to a holding role, which has naturally taken away the memories of his box to box breaks which produced such thrilling winners like the one against Swansea that kickstarted Liverpool’s title charge under the Northern Irishman. In more recent times, there were more eye-catching World Cup performances, helped by the brave new world of Gareth Southgate. In recent times his best work has been back-breaking but unglamorous. During the blitzkrieg opening of the Reds Champions League campaign against PSG, he regained possession three times in succession from Marquinhos and then Neymar. This is the player the naysayers fail to acknowledge. The 28-year-old has always had to fight like Conor McGregor to prove his worth. He may stream off the expletives on the pitch like the Irishman, but he carries himself better out of the ring. Having been given a chance at Sunderland by none other than Roy Keane back in 2008, the teenager had to be as tough as granite to last the pace when living with Osgood-Schlatter disease, a painful condition that affects the upper part of the shin. The criticism has been coming from all sides, and it has been spitting from all heights (Sir Alex Ferguson’s observations of a dodgy “gait” included). The main vitriol comes from his own supporters. Henderson can’t play a forward pass, apparently. He offers nothing but a side to side crab movement. He is an artisan with no craft other than wearing his heart on his sleeve. Wrong. Wrong. Wrong. April was the month where perceptions may have changed.